Notre Dame de Paris, often known simply as Notre Dame in English, is a Gothic cathedral on the eastern half of the Île de la Cité in Paris, France, with its main entrance to the west. It is still used as a Roman Catholic cathedral and is the seat of the Archbishop of Paris. Notre Dame de Paris is widely considered one of the finest examples of French Gothic architecture. It was restored and saved from destruction by Viollet-le-Duc, one of France's most famous architects. Notre Dame translates as "Our Lady" from French. During the early 19th century, the cathedral was in a state of disrepair, and city planners began to contemplate tearing it down. French novelist Victor Hugo, an admirer of the cathedral, wrote his novel The Hunchback of Notre Dame (titled in French Notre Dame de Paris) in part to raise awareness of the cathedral's heritage, which sparked renewed interest in the cathedral's fate. 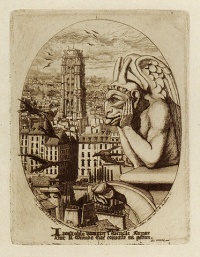 A campaign to collect funds to save the cathedral followed, culminating in the 1845 restorations. The cathedral was featured in the film Amélie. The cathedral was featured in the Disney animated film The Hunchback of Notre Dame, loosely based on Victor Hugo's book. Unless indicated otherwise, the text in this article is either based on Wikipedia article "Notre-Dame de Paris" or another language Wikipedia page thereof used under the terms of the GNU Free Documentation License; or on original research by Jahsonic and friends. See Art and Popular Culture's copyright notice. This page was last modified 22:03, 21 April 2019.